5 MUST TRY STREET SNACKS OF TAIWAN! Getting up in the morning can sometimes be a struggle without having to think about rushing to get ready, packing your bag, making your lunch, having breakfast and making sure all of your homework is stuffed into your bag in a matter of 30 minutes. Despite having done this exact routine 5 times a week for 3 academic years, I still haven't quite mastered it yet. On a school morning, we all want to maximise the time we have in bed as much as possible by cutting or shortening thing in our routine. For me, that is mostly the bag packing. I like to pack my bag the night before and make sure I have all of my homework so, in the morning, I don't have to worry. Also, it gives me more time to look for misplaced books and/ or homework. 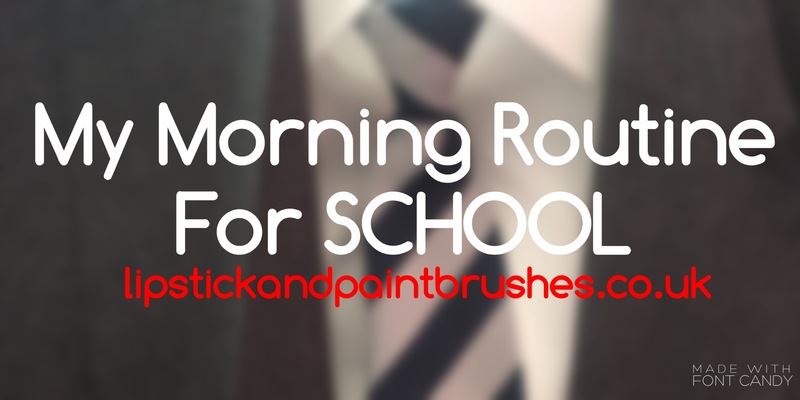 I have a post on what I pack in my school bag and it will be linked here! Lastly, this is a good time for me to sort the uniform that I will be wearing. This year, due to the fact that we have switched to shirts instead of polo shirts which take ages to iron right, it will be essential for me to prepare my uniform the night before. 6:00am: I usually wake up straight away after hearing my alarms but it takes me a while to fully come around but on a school morning, there's no time for that. After around 10 minutes of trying to get myself together to actually get out of bed, I do my skin care. I do a more intense routine at night as it helps me to relax but in the morning, a quick, gentle exfoliating using my Garnier Pure Active Charcoal Scrub and moisturise. At this point in my morning, I normally procrastinate by watching youtube videos that were posted while I were asleep and desperately NEED to be watched (like Shaaanxo's vlogs). At 6:30am, I sit at my vanity and do my makeup for the day while carrying on watching youtube videos. I'm going to do a separate post on my makeup routine for school but in a nutshell, I use 8 products and take around 30 minutes to perfect. As for my hair, I normally throw it up in a ponytail/ bun to get it out of my face. 7:00am: After getting ready and double checking my bag if I have time, I make some breakfast. Sometimes I like to get something from the shop (allowing me more time in bed) or I take something while on my way, but I always have time for breakfast at home on the first day due to not being as tired. From watching YouTubers' school morning routines, I wonder how they have time for an extravagant breakfast when I bearly have time for cereal, but that would mean getting up earlier and I really don't want that😂. I just like to make a coffee in a flask (in case I don't finish it in time) and a bowl of Weetabix to have a good start to the day. After breakfast, I normally have a few minutes to grab my water bottle (that I filled and left in the fridge overnight), put my phone, purse and headphones in my pocket, and leave to go to school! Thank you for reading "part two" of my B2S series. If you liked and/or found this interesting, please give it a like and follow me for more! Also, I would really appreciate it if you went over to my personal blog (https://lipstickandpaintbrushes.co.uk/) and followed me there to read more. I post on both platforms every Wednesday, Friday, and Saturday at 5pm GMT!